It was a happy tale for Manchester United , as Berbatov , hero for the United in the clash against Sunderland scored in the 59th minute to gain 1-0 lead. 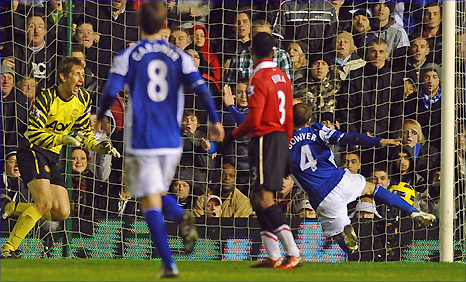 But it was until the game into its final minute, Lee Bowyer struck a controversial goal stunning Manchester United and secured draw for Birmingham City. United who were looking to regain the top spot after Manchester City took the top spot earlier in the day with thumping 4-0 over Aston Villa with Balotelli scoring a hatrick were denied their chance. Now Manchester United and Manchester City both have 38 points, with United played lesser games than that of City's. Dimitar Berbatov took the early honours for the day as he took full advantage of return pass and drove the ball into the post from 18 yards. They were sailing quite confortably until something controversial just before the final whistle took place. Bowyer's goal was pretty controversial , as he led to his team to an equiliser, as it looked like a handball and also it looked like an offside as well ignored by the referee.Also the goal might have been ruled out as Zigic had made a foul on Ferdinand as he leaped upto to meet ball by Johnson. What ever happened in the game is aside, but the thing is now they are level with Manchester City, and would need some serious working if they want to keep themselves at the top of the table . With one point it proved enough for Manchester United to stay ahead of Manchester City on basis of goal difference.This also have only managed to win only won encounter out of eight in this season as well, while drawing other.